It’s not every day I get a box in the mail that isn’t from Amazon Prime. Yesterday was an exception. 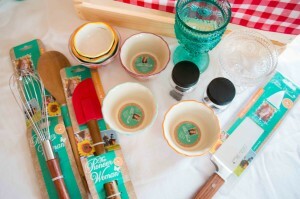 A box arrived from Ree Drummond, The Pioneer Woman, shipped from her small Oklahoma town to my small North Dakota town. 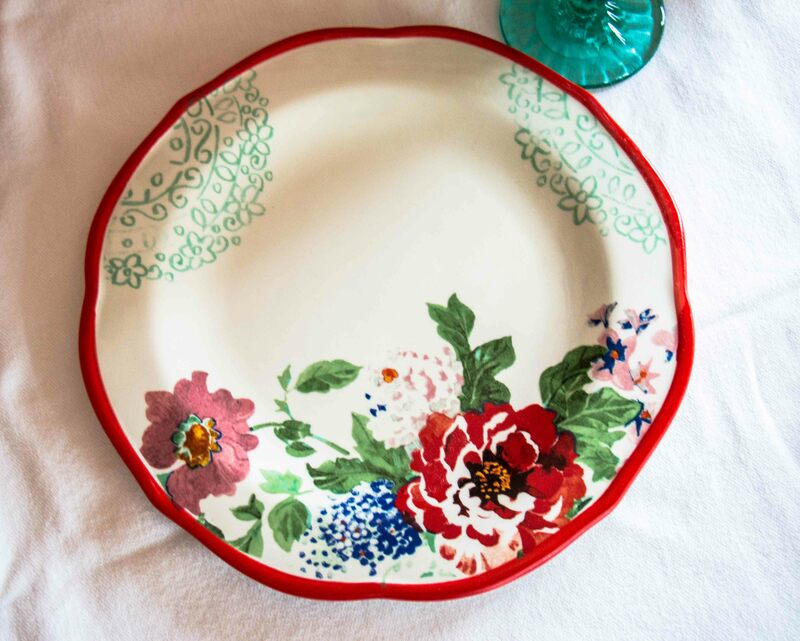 Inside were several of the new Pioneer Woman collection of kitchenware and dinnerware items I had already tried to buy on Walmart’s website earlier in the day. I had screen grabbed my empty cart with items now out of stock that I had not purchased quickly enough to snag. I shared in social media that I had to wait to go to a Walmart 100 miles away when the PW Collection becomes available in stores on September 14. I’m a shameless promoter of people and brands I love! Then my husband sent me a casual text about a box from Ree Drummond and Hunter’s new football gloves and a replacement pad for his helmet arriving. Husbands aren’t as excited about boxes from Ree. Nathan was more concerned about getting the football items to Hunter before practice. But I was giddy about Ree’s package. I packed up Baby Kinley, who I babysit for a volleyball coach friend on Tuesday afternoons and we went to our small town office to get our box from Ree and team. In what seemed like a regular Tuesday to kick off September became instantly special. Our puppies had figured out the latch to their new kennel before school even started and I had been frazzled for the twenty minutes we didn’t know where they were. I would have remembered September 1, 2015 for that moment alone if this box hadn’t arrived. Instead I will remember September 1 for pretty Pioneer Woman items that arrived on the prairie. Like new cooking utensils and dinnerware that my kitchen is now more beautiful and useful for having. 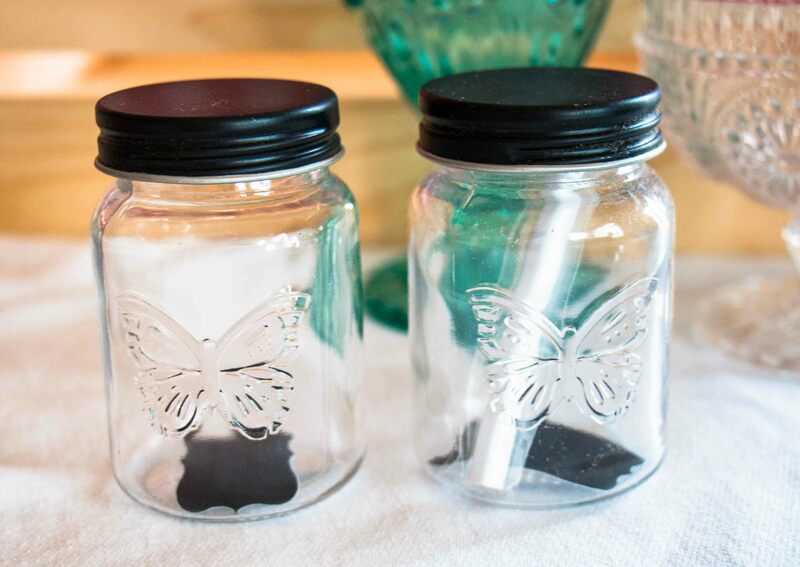 Perfect little jars I can fill with my favorite Penzey’s spices. 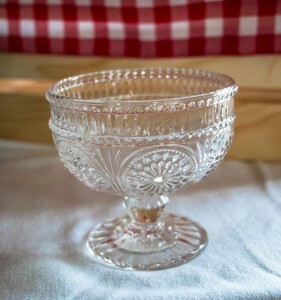 Dessert dishes begging for homemade ice cream or sorbet. Ramekins calling for individual servings of dessert, salads or steamed veggies. I can already see sweet potato casserole with toasted marshmallows in these this fall. 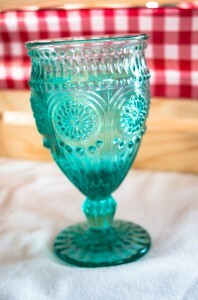 I was debating between the clear and turquoise glassware and think having a mixture of both will be my choice. It’s heavy and higher quality than I would expect from a big box store. I think the price points make all the items accessible for any type of home cook, in any location. There are a lot of things I respect about Ree, her family, values along with the stories and food she shares. Looking through the items sent gave me a respect for the farm feel of all of them, a welcoming, pull up a chair, you’re always welcome here feel. It’s a part of what farm and ranch values are. Ree Drummond, no matter how many millions of people read her blog, books or watch her Food Network show, stays true to who she is for her family’s ranch and community. 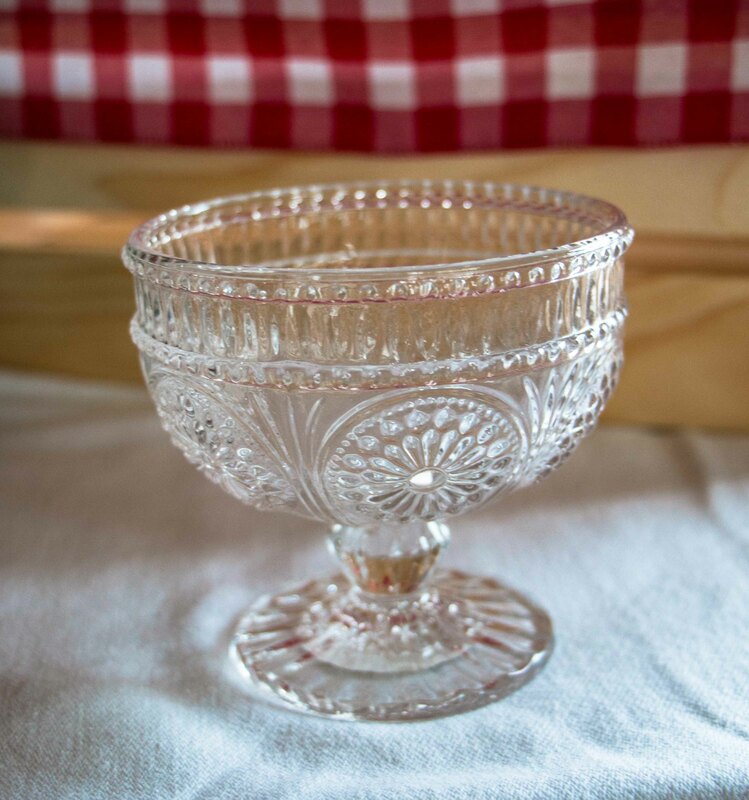 Of course I love the vintage look and feel of all the items that perfectly compliment my white Crate and Barrel everyday dishes and Lenox china. There were a few broken items. Rural Oklahoma to rural North Dakota. The pony express probably dropped the box. It gives me a reason to purchase a few items when I get to a Wal-Mart in a few weeks. Ree and I share a birthday, January 6. Other than that, we share a love for the prairie, cowboys, wide open spaces, city visits and much more, like butter. Like millions of Americans, my girls and I love her television shows and I’ve followed along to her adventures for years. But the most important thing about Ree Drummond to me is not this kitchen line. It’s an extension of it. Ree and the Drummond family fabulously tell the story of American agriculture. It’s at the root of who they are. They are the only people who can brand cattle and then grill steaks on the Food Network and have millions then go buy steaks at their local grocery store. They do not demonize food choices or other ways of raising cattle, grazing or how someone else farms. They tell their story of how they raise food and their family. 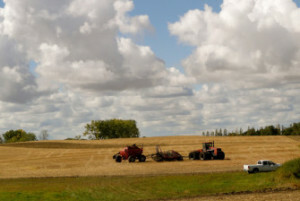 Ultimately Ree has taken her writing, photos and story to new levels that has advanced all of American agriculture. From me, a fifth generation American farm girl, wife and mama to you, Ree, family and team, thank you. As a marketer and communications professional, I commend Ree and the team she surrounds herself with that take the time to personalize a big launch like this Pioneer Woman Collection at Walmart. The attention to detail is noticed. I have worked on many advertising campaigns in my past career and know it takes selfless people behind the scenes to make anything like this be successful. It’s classy and well-done. Happy cooking from my kitchen to yours! 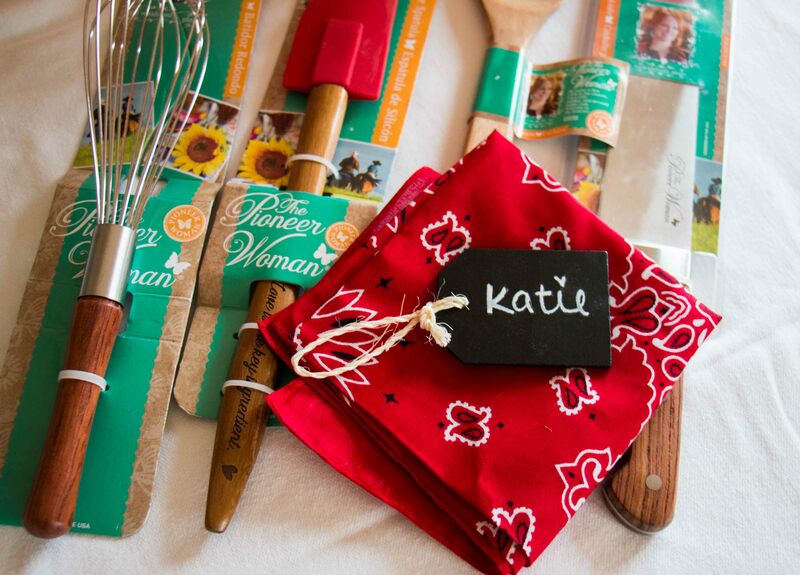 Did you purchase items yet from The Pioneer Woman Collection? What items are you adding to your Christmas or birthday wish list? My BOYS and I watch her show too. Of course we notice their John Deere loader tractors and talk about the breeds of cattle they use since they live so far south and other Ag practices they they probably haven’t seen before. Oh and the horses!! AJ likes to cook and has converted our house to cast iron skillets that he rescued from the shop that were holding bolts, nails, etc. we’ve even made a few recipes together. If it’s up to me I will have him cooking and I shall not cook again until he graduates!! That’s fantastic Tamra! If I had young boys they would be watching also. My teenage boy watches if he is around and might be watching for Ree’s daughters more than the cooking but he is helpful in the kitchen. Boys and girls who cook with their parents is a win all around! The first item I purchased was the 7 qt. Dutch Oven, which I will use to make my Grandma’s dumplings! I wanted to order a few glasses, but alas, I had the same problem with the out-of-stock issue! 😀 I’m so excited for you! And how gorgeous is it all??? I’ll drive to pick you up and we can have a prairie mamas Wal-Mart outing!!! This is so great. Two of my favorite bloggers with this wonderful connection. You both represent American agriculture so well. Keep up the good work and enjoy your wonderful surprise from Ree. I will be looking for them in my Walmart as well. Thank you Miss Carol Ann! I love this! What a classy gal, sending cool stuff to another classy gal! Very cool. I want every single piece, just have to pick a few out for each celebration! The glasses, plates, ramekins and cake stand top my list!!! I am in love with the cake stand too! I have no idea what I would use it for so I need to find a place to use it as decoration. Thanks ladies, I agree! 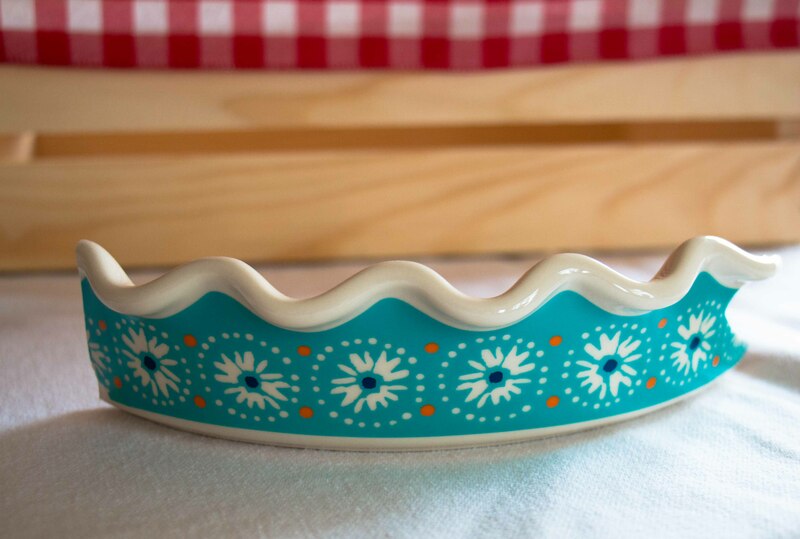 Cake stand for sure and ramekins. Plates, glassware. I heard a cookbook stand and other items come out in October. So many choices. Christmas shopping at Wal-Mart! This is so awesome! I am so excited for you, especially since you missed out on ordering. I am a fanatic for vintage pieces and I just cannot wait to get my set in my hands. I totally agree that her and her family share the story of American Agriculture. When we talk about ag bloggers, so many people forget her because she shares in such a subtle way. She’s not in your face and she does talk about cooking mostly. But her show and her blog definitely have a strong agriculture and rural tie. Ashley what you say is right on. The subtle way instead of in your face is key I think! Thanks for your kind words. I am utterly jealous, but of course very happy! I need to get my hands on her gorgeous stuff somehow! Is it against Canadian rules for me to send you a few pieces as a gift? Or I think our American visit is a good idea! That Ree is one classy lady. Just love her! I can’t wait to get in and buy some of her items. They look beautiful. Enjoy them and thanks for sharing! What a fun gift. A classy lady like you Maria! I like her new dishes, hope they will be for sale at other retailers. I try not to patronize Walmart. As a small business owner I understand that perspective but think distribution in Wal-Marts is very smart for this line. It brings it to more people across many locations! You are so lucky to receive your box of goodie! I love everything I have seen of hers, hope to get a few of the pieces! What an incredibly fun surprise! I bought the drink dispensers with the two, 1- gallon jars. 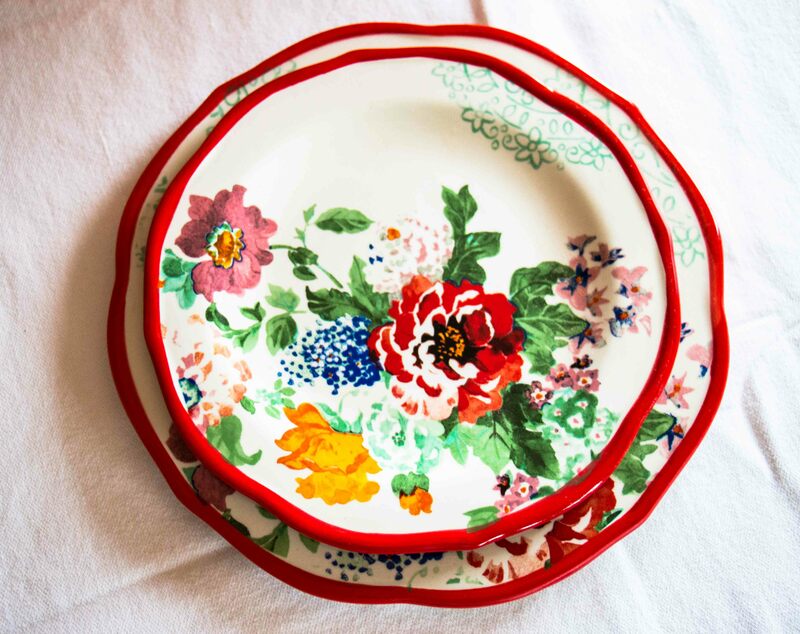 I LOVE the red floral dish you received and the red-rimmed set but alas, out of stock. 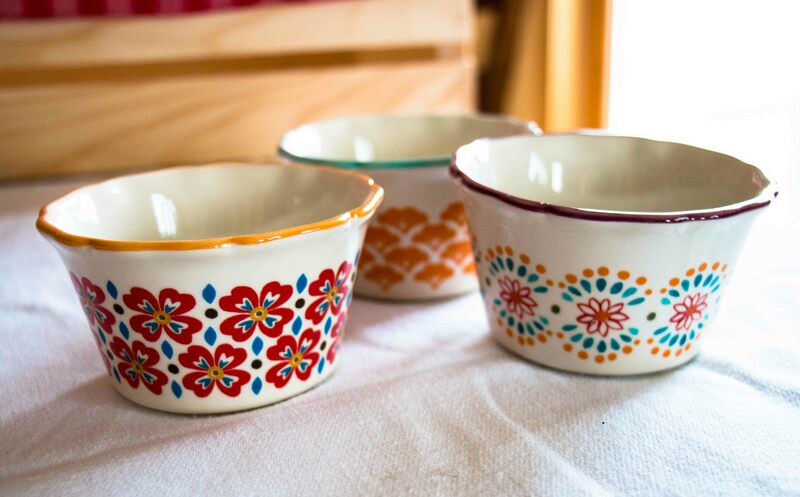 I plan to get a couple of sets of the ramekins. I want to keep a set. I also plan to gift some rosemary to people and I think they would be BEAUTIFUL packaged in one of her adorable ramekins. Gifts are a great idea, Ann! I plan to purchase a few for gifts for Christmas also. Love your rosemary idea. What a great post to read, and how fun did that delivery make your day? 🙂 I too was to late online, but will be adding a few pieces of her beautiful bakeware to my stash, as well as purchasing it for my staff this Christmas as gifts. Happy week! The bakeware piece I received was broken but definitely adding a few of those pieces too! Definitely GREAT Christmas gifts!